Martin Bowler needs no introduction, he is one of the most prolific specimen hunters of our times and an expert at targeting big fish. Martin has done it all and has the British record for more than one species. Martin writes for Angling Times and you can follow his latest catches there. What kind of waters will you be looking at? 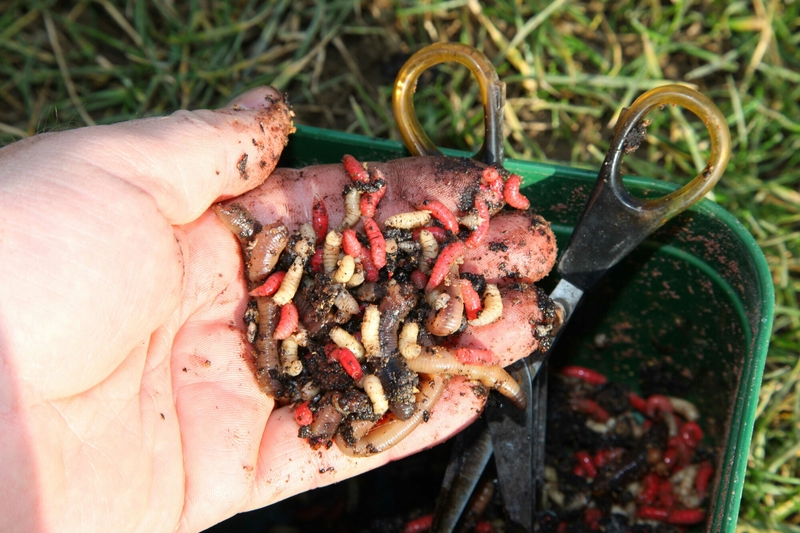 So you’re looking for somewhere with a rich bait source whether it be on a river or a lake. If there is a rich food source then obviously this will help them put on the weight. Like all predators they don’t like angling pressure, so look for out of the way places that don’t get much attention. Size wise, you’re looking for just before they spawn, to get them at their highest weights. Before spawning, they seem to gather into larger groups from February into March. Look for areas like snags, reedbeds, drops offs, overhanging trees, just any feature that they can use as an ambush point and they seem to like to spawn around fallen trees and things like that. Also get talking to other anglers as that can be a big help in locating your prized perch. Now you know that perch are present in your chosen water, what will be your first plan of attack? Well firstly I will walk the water looking for any likely looking ambush points where they can lay and strike out from. Snags, drop offs, don’t ignore any feature they can use to their advantage. The time of day is critical. In summer the best time to fish for perch is dawn, but in the winter the best time to fish is dusk and we are assuming the water is at least semi clear. So many times in winter I’ve seen guys turn up for first light and by two o clock haven’t had a bite so go home disheartened. So many times I’ve sat in the swim all day and not had bite. Then right on dusk….. bang a big perch! And that perch has been sitting there the whole time. In general the colder the conditions with frost on the ground, the closer to full darkness is when the bites will come and it will come earlier the milder it is. As a general rule, anytime from 3pm onwards is the magic time. So don’t rush down, get an extra few hours in bed, wrap up and you will enjoy your time more on the bank, which all sounds good to me. 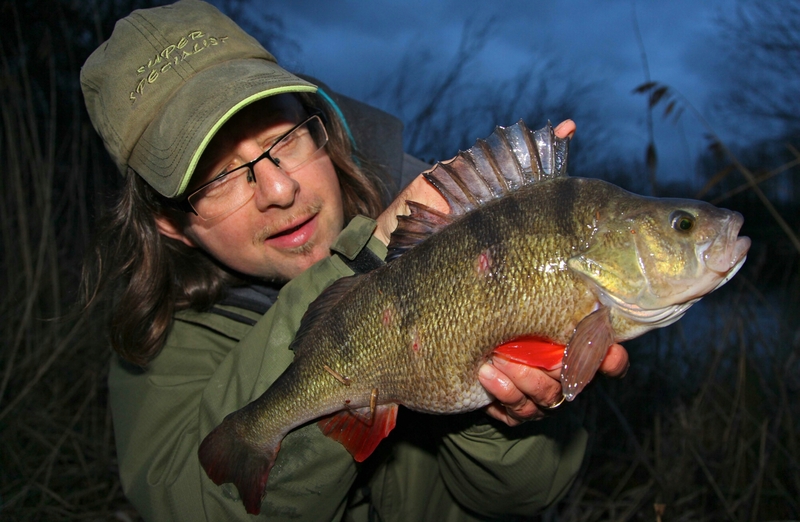 What do you consider the best methods for catching big perch? I would firstly search the water out with small lures and drop shotting. Once I’d found some signs of life, even just a pluck, can put you in the right direction as where there is one there will be more. I’d come back mid afternoon to the same spot, and feed with chopped worm, caster and red maggot, then fish a lob worm over the top. How do you rate deadbaiting for them? I’ve only done well on deadbaits on a very coloured commercial water. It can work on a coloured waters where they will be feeding more on scent, but I wouldn’t be confident on a clear water with dead baits I’d much rather fish the worm. 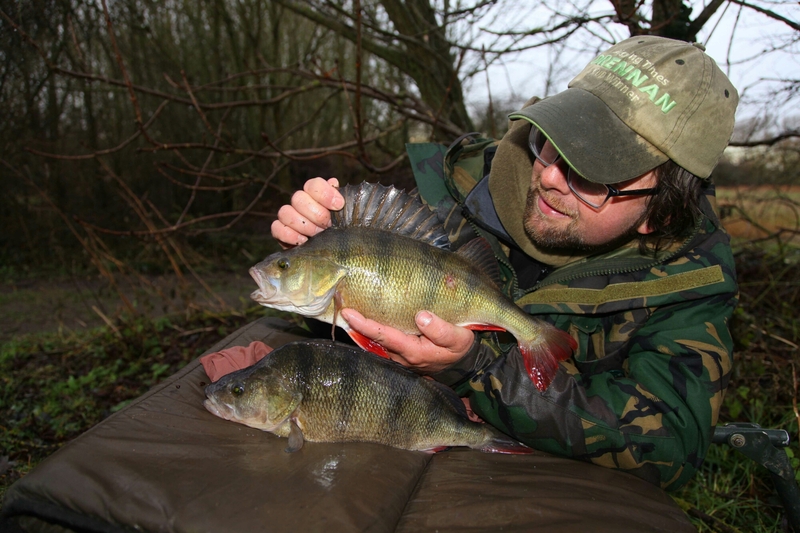 What are your preferred set ups for fishing for perch? Well if it’s a small intimate venue nothing will out fish the pole. It’s not really a favourite of specimen hunters, but the bottom line is, within the 14m range you would be hard pressed to find a better way of presenting baits. You can make the worm dance as you slowly lift it up and down. Your introduction of the feed will be spot on and it just works really well. 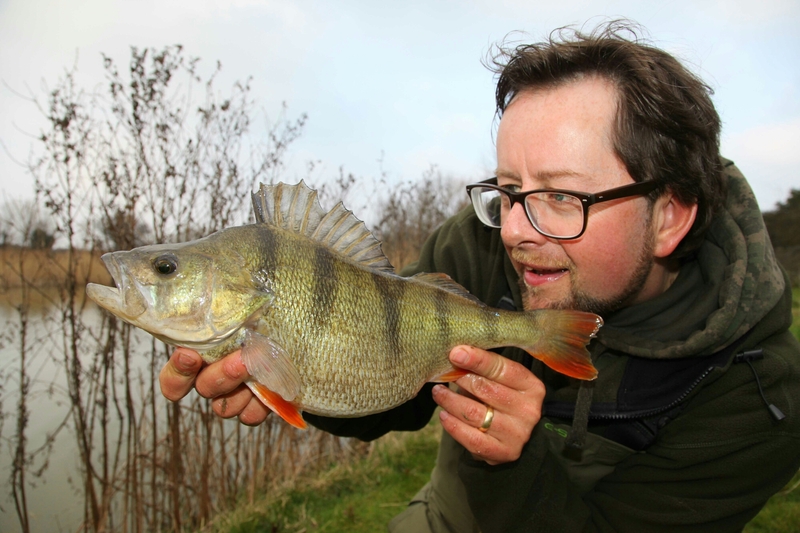 It accounted for a 5lb 4oz perch while I was filming catching the impossible. If your fishing close in but don’t pole fish, you can use a long float rod to mimic the action of the pole. If your fishing down the marginal shelf a 15ft float rod would be perfect. I’d fish 4 or 5lb mainline straight through to the float. Spend time plumbing up correctly, fish down the marginal shelf and importantly feed the spot very accurately. Be careful if throwing in by hand that your not scattering the bait too much. It’s amazing when you focus the feed and you fish right on top on the size of a dinner plate how much better the fishing will be. At range you’re gonna have to move on to a feeder set up. A lot of specimen guys will fish with two rods with bobbins etc. and it’s not very often I choose to fish this way. I much prefer fish from a seat box. The reason i do that, is as specimen hunters we are inclined to sit on a low chair, and our casting and baiting is all over the place. 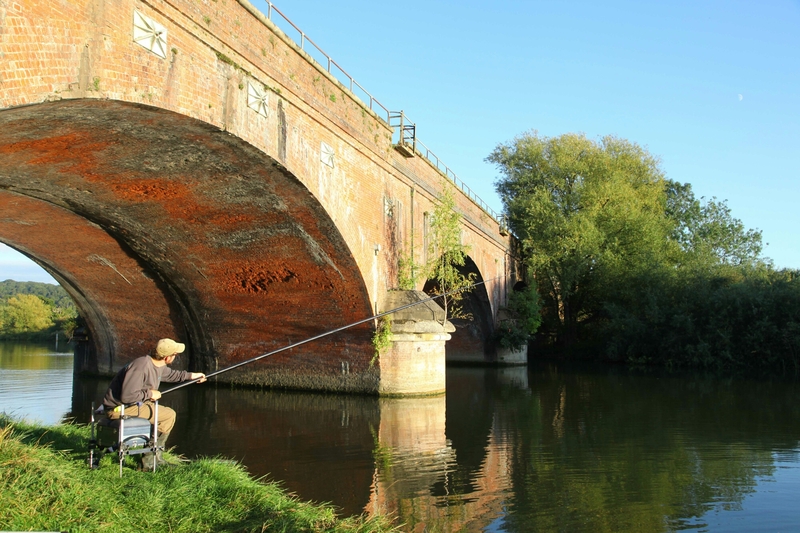 If you are sitting up on a seat box like a match angler, you are much better positioned to attack and with everything close to hand you will cast and bait up much more efficiently. 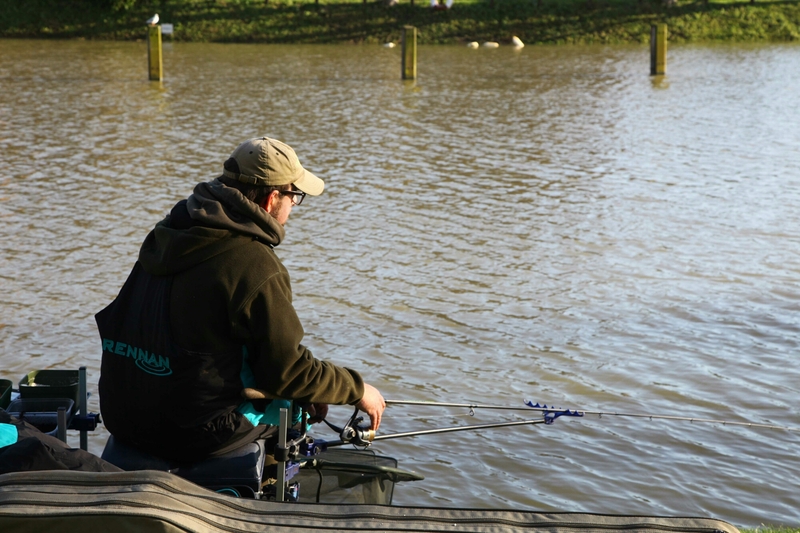 Don’t worry if you haven’t got one, you could always use your unhooking mat on top of your chair for extra height, your only going to be fishing for four to five hours so you can put up with that for a good fish. I bring a carp rod with a small spomb, fill it with the chopped worm, caster and red maggot. I will have use the line clip to tightly put the bait out. I’d then cast slightly further with my feeder to allow for the drop and draw back then clip up. So then I just use my feeder with red maggot on 6lb main line, on a paternoster rig making a small boom section by twiddling the line up to avoid tangles. My hook length would be 4lb fluorocarbon and a size six hook with my worm bait. I will keep feeding tightly and accurately over the small area and remember it’s better to fish one rod well than two rods just average. Martin thanks as always for giving your time and I’ll see you soon. This entry was posted in Coarse fishing and tagged Martin Bowler, perch. Bookmark the permalink.